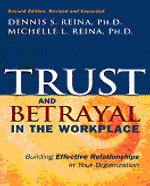 The economy’s collapse has surfaced major and subtle ways workplace trust is broken, betraying relationships. While this collapse highlights the dynamics of trust and betrayal, they have always existed. Trust is always vulnerable because it is constantly being built and broken.